I want the Space Invaders rug but not the $3,000 charge I'd have to put on my credit card to get it. 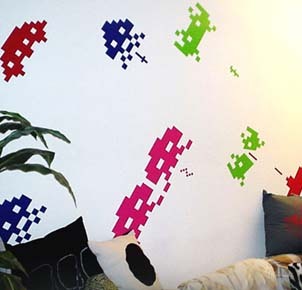 While reading BoingBoing I found a compromise, the Invader Wall Graphics by Blik. For $45 you get eight decals in assorted colors, including "color-coded missiles." How can I go wrong? I noticed Velocity has them for just $40. If I'm reading right, these are vinyl decals that you can peel off your wall if you don't like them, but you can't restick them onto another wall. Be warned. I'm still getting them, of course.